A small start-up, NewsGuard, says it may have a solution. The effort is led by a pair of veteran news executives — Steven Brill, an author and the founder of the magazine The American Lawyer, and Gordon Crovitz, a former publisher of The Wall Street Journal. 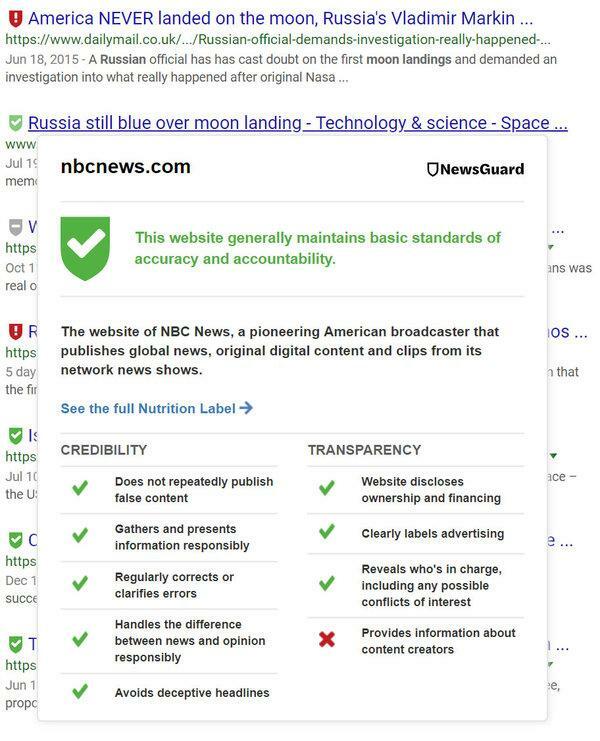 NewsGuard has created the equivalent of nutrition labels for news organizations, rating more than 2,000 news and information sites with tags: red for unreliable, green for trustworthy. A team of roughly 50 journalists and analysts is making the evaluations. NewsGuard has given its stamp of approval to established publications like The New York Times and The Wall Street Journal, as well as later entrants like BuzzFeed and Newsmax. FoxNews.com, The Hill, The Daily Beast and HuffPost have also gotten green lights. Sites to watch out for, according to NewsGuard, include Infowars and Breitbart on the right, and Daily Kos on the left. Media Matters, a left-leaning advocacy organization with a prolific media-watchdog blog, has received a green rating, but scores negatively on four of the nine criteria used by NewsGuard. The start-up hopes to become a regular part of the reading experience on the web. Its premise is that it is more efficient to rate news organizations than the endless stream of articles published on the web. The service, free to readers, offers a browser extension that shows a news operation’s rating when a reader lands on its site. The NewsGuard tag also shows up in search results next to article links for those who have the extension. “The point is to make this ubiquitous,” Mr. Brill said in an interview. To make money, the company has pitched major technology companies to license its software and incorporate its ratings into their services. The first major tech player to sign on is Microsoft, which has agreed to install the system onto its mobile browser, NewsGuard said. The venture is not Mr. Brill’s first go-round on the media beat. In 1998, he founded the monthly magazine Brill’s Content, which chronicled how the journalism sausage got made until it closed in 2001. NewsGuard has raised about $6 million at a valuation of around $20 million. Its biggest corporate backer is Publicis, an advertising holding company. Last year, some advertisers fled YouTube after they noticed their messages were appearing alongside videos promoting terrorists. And while they haven’t abandoned Facebook, marketers are requesting more data to make sure their brands aren’t being associated with questionable content. Facebook has become a flash point for the spread of false reports. To combat media pollution, the company has worked with fact checkers and has enlisted third-party groups, including The Associated Press, Snopes and PolitiFact, to make evaluations. Still, it can take up to three days for Facebook to verify content — which has little or no effect, in most cases, since articles go viral in minutes. Facebook and other social networks have not signed on with NewsGuard, but Mr. Brill and Mr. Crovitz anticipate that some kind of ratings service will eventually be adopted across the web. And despite their positioning as a nutrition label for news, they said no one should interpret their work as an endorsement for some kind of media equivalent to the Food and Drug Administration. Next PostNext Commuter Knits a ‘Rail Delay Scarf.’ It Fetches $8,650 on eBay.